When I craigslisted the silverred chairs a few months ago the seller gave me this printer stand/file cabinet. Its a solid piece and I love revamping stuff so I said Thank You! and proceeded to ignore it until this week. As always I forgot to take a before picture. So here it is in its "two paint strokes in" glory. See my teeny paint tray and foam roller? $3 for the set at Home Depot and I cannot recommend it enough. 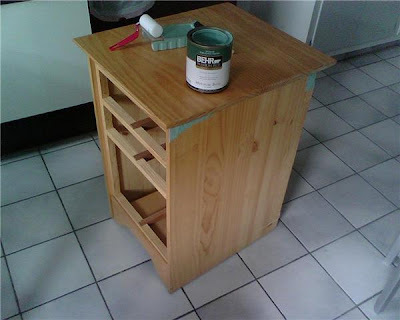 Its perfect for tiny projects like this and keeps those blasted paint strokes away. I painted it with contrasting knobs and sat back to contemplate. 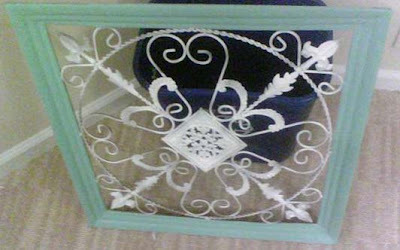 Actually I went on-line and visited Dragonfly's blog and was suprised to see she'd just garage saled a piece that looked a lot like this one! I bought $3 stencils at Michael's using their 50% coupon. While the paint was drying I turned to my old lampshade. Two houses ago I had a red bedroom (seriously - it had red carpet and curtains) which I'd accented with more red and white. I'd sewn red ribbon inside the lampshade so when the lamp was on red showed through. When it was off it was a very generic white shade. I removed the red ribbon and stenciled the shade in blue. This is not a job for perfectionists! Not a single fleur is perfect which I say adds charm ;) The lamp is a Target find from 3ish years ago and see that thing hanging on the wall over the lamp? This was a garage sale freebie originally done in a coppery color. I sprayed it months ago and set it aside too. This week I painted the border to match the lamp and stand. I used 3M hooks to attach it to the wall. Each hook is supposed to hold 5lbs so lets cross our fingers and hope they keep their promise! I put one of my many new mirrors on top because I like shiny things. Gorgeous! I love that blue...it's so addicting. And that lamp? I'm so inspired! OMG! Yours is gorgeous! Cheap or not those stencils added so much charm. Great idea with the lamp...the red ribbon & the stencils. Such a pretty vignette you've created! love the color, it turned out great! Wow, great transformation. I love the color choice. Lots of great ideas to copy here... It turned out beautiful! Great job! Everything looks beautiful! I love that you tied all the pieces together, and I really like both of your ideas for sprucing up a lampshade! Wow. I really like the color. I have a hard time trusting myself with color. Way to go. Thanks for stopping by my blog. I LOVE the colors & stencils here! Its so light and feminine... beautiful! 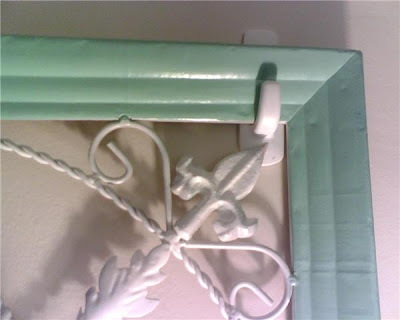 Tiffany blue is one of my favorite colors--to wear, too! Great job and thanks for stopping by! This is beautiful! I love the lamp and table together! Great job! I love Tiffany box blue -- well, let's be honest, I love ANYTHING Tiffany! Love your makeover, it's very chic! Thanks for linking up with me -- be sure to enter the Purdy Paintbrush giveaway! And the sharpie floor is CRAZY!!!!!! Love the color -- and yes, I love those little foam roller sets, too. The BEST. Awesome! I cannot get enough of that blue, and the stencil really makes it :o) I used to have one of those foam roller sets...methinks I shall go procure another. I love that blue. The stencil looks perfect on it. Love the shade too. Great job! Thanks for sharing! Who doesn't love tiffany blue?! Great job! I really like your cabinet in Tiffany blue! It's so fresh and friendly. Your lamp, table, and wall art are perfect for each other! Wow, turned out so pretty!! What is the name of the color blue that you used? This is the shade I'm planning on using for my redo in the kitchen mixed with chocolate brown. Hey Cindy, its Mermaid Net from Behr - hth! You did a fabulous job on that table. I love the color and the stencil job, bravo! Happy Friday and thanks for stopping by today. Thanks Anny for letting me know about the color! Going from the old hunter green to this shade of blue is going to be exciting! Whoo-hoo! Cottagy cute! 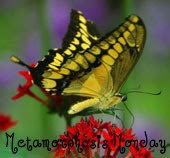 Thanks for linking up to Thrifty Thursday this week, my friend! You did a great job on all of your projects. You are the project QUEEN. Thanks for participating. I like it all--neat ideas. Especially the shade!